"Animal Death" by David Malki! What if Romeo never met Juliet? What if Juliet got really buff instead of moping around the castle all day? What if they teamed up to take over Verona with robot suits? Anything goes in Romeo and/or Juliet, a hilarious choose-you-own-path adventure book from Ryan North. Shakespeare’s iconic tragedy gets a refreshing makeover with 100+ endings, so forget the double-suicide conclusion you read in high school and embrace a story where Juliet ditches nobility for life as a pirate. Or Romeo becomes a Grim Reaper. Or they both die, but at the hands of ninjas rather than misguided teen angst. North, creator of Dinosaur Comics and author of the Hamlet adventure book To Be or Not to Be, delivers the most entertaining Shakespeare adaptation you’ll read. 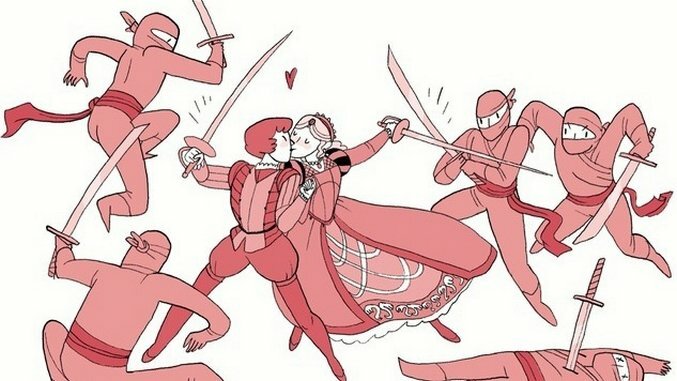 And with over 100 gorgeous illustrations from Noelle Stevenson, Randall Munroe, Kate Beaton and more, Romeo and/or Juliet promises to entertain you for hours. Check out a collection of the illustrations in our gallery, and click here for more info about the book.